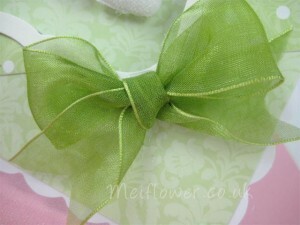 Hand made Ribbon bow.Premium quality sage green sheer organza ribbon with woven edges to prevent fraying. 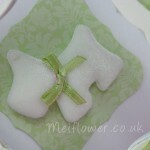 Ideal for card making, scrapbooking, wedding favors and crafts. The soft organza ribbon is ideal for tying ribbon bows as it holds it shape really well. 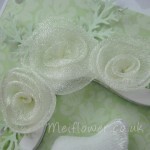 Other organza ribbon colours are available on our website. This entry was posted on Monday, March 7th, 2011 at 10:47 pm	and is filed under . You can follow any responses to this entry through the RSS 2.0 feed. You can leave a response, or trackback from your own site.